I've been away from the site for a month or so now — after my dad was in the hospital, I discovered I needed to step away for a while to refresh the old batteries and not burn out — but if anything beyond awards season and a pile of new books could persuade me it's time to end the sabbatical, it's being made aware your work is being shamelessly plagiarized by a blithering idiot. 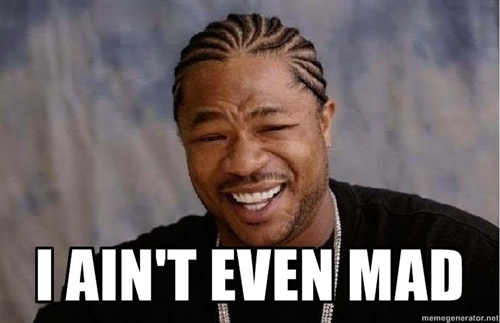 No one seems to care much about internet piracy and infringement, but when it happens to you, you do feel a sense of violation, even when it's done by someone totally lame and stupid. Which brings us to Cesar Noel Quinon. I'm not sure why someone would choose to rip off, of all things, online science fiction and fantasy book reviews. But Cesar has several other blogs on unrelated subjects, so I think all he is is a routine dirtbag who throws up blogs in the hopes of generating ad revenue to make an easy buck. Can't say he's very clever or successful at it, as his blogs aren't exactly littered with banner ads. But I'm still going to have fun publicly shaming the moron. I discovered Cesar when I got an email from John Scalzi the other day (that joke in the subject line? that's John's — credit where it's due and all that!) 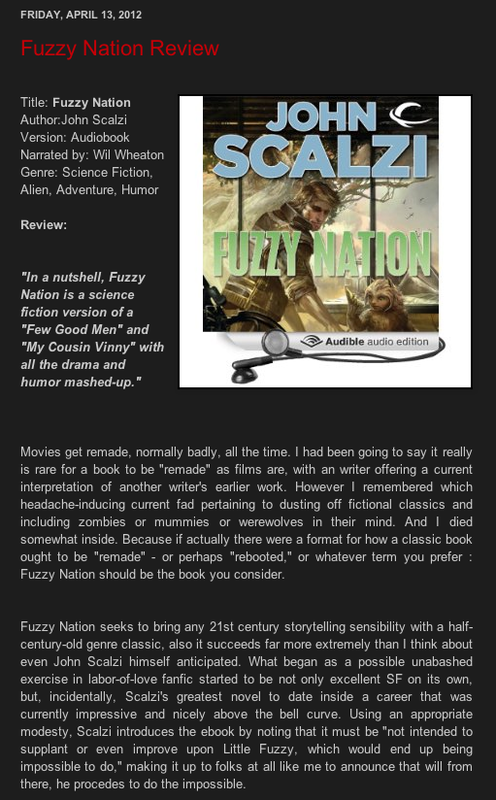 letting me know that Cesar had ripped off, almost word for word, my review of John's Fuzzy Nation. Cesar just hits "select all," command-C, command-V, then switches a few words thinking no one will notice. He is exactly that stupid. 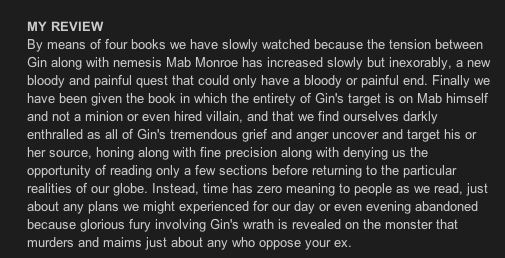 As I've submitted a TOS violation report to Google, his blog at Fictional Books Blog may be taken down relatively soon, so I'll provide both the link and some screenshots for your amusement (click on each screenshot to see the full image, if it's too small for you to read here). Here is my review of Fuzzy Nation, and here is Cesar's hack job. I've since found out he's plagiarized the following other reviewers and bloggers. (Again, screenshots of Cesar's passages are provided for you to compare in case Google takes his blog down and the links are no longer good.) I have to say, Cesar is like one of those epic clods you see on "World's Dumbest Criminals" shows, who tries to hold up a bank or convenience store with a cap gun and a paper sack with eyeholes poked out covering his face. Cesar's "review" of Jennifer Estep's Spider's Revenge was stolen from Jenny at Supernatural Snark. 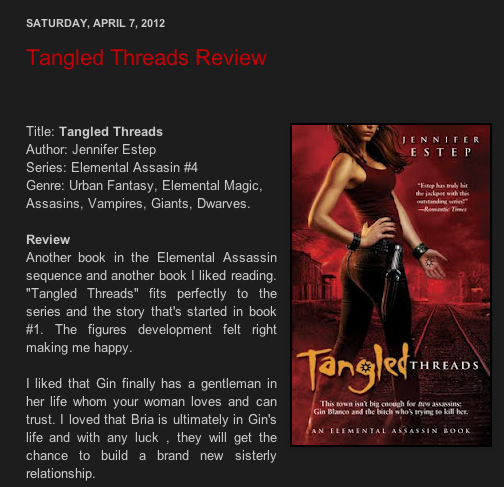 His "review" of Jennifer Estep's Tangled Threads was stolen from Sabrina at About Happy Books. 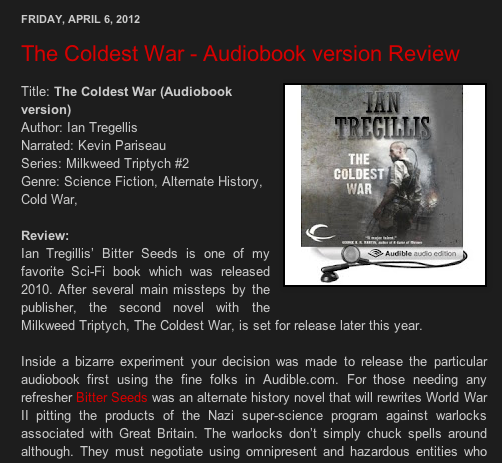 His "review" of Ian Tregillis's The Coldest War was stolen from Mike Ferrante at King of the Nerds!!! 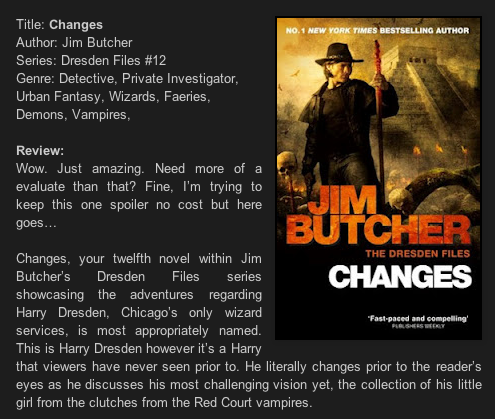 His "review" of Jim Butcher's Changes was stolen from Love Vampires. 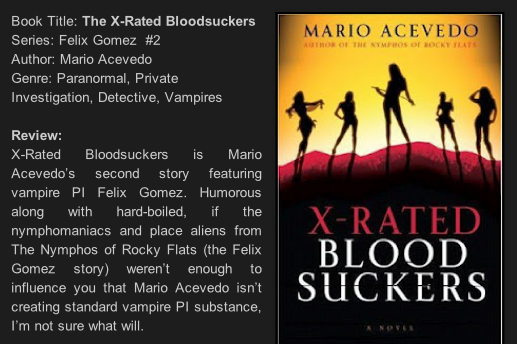 And Cesar hit Love Vampires again to swipe their review of Mario Acevedo's X-Rated Bloodsuckers. I'm sure Amanda and the lovely ladies on her staff are feeling very special. After a while, the nonstop flood of outright theft that kept popping up so brazenly on my monitor (for a guy with a Google+ account, Cesar seems ludicrously unaware that people can use Google to find out what he's been up to) just got to be funny. I don't think I've laughed so hard since Sarah Palin confidently announced she could win a debate with Obama. Yes, this kind of infringement should be taken seriously (which is why I've submitted the TOS violation report to Google). But the phenomenon of Morons On The Internets is a thing we have probably all had to deal with in one form or another. And when the moron in question displays a truly...special...level of stupidiocy as our buddy Cesar, well, there's much satisfaction in publc ridicule and mockery, you know? If Google doesn't come through, you should consider consulting with a lawyer. You might even find one that would do it on a contingent fee. I'm not familiar with internet copyright law, but this seems like a clear cut case of conversion. Perhaps when Quinon gets a subpoena in the mail he'll be ready to settle. That is definitely an option on the table. The difficulty might be that Cesar is in the Philippines. So there would be the international problem in actually litigating. Seems to me the easiest recourse is to go through Google first and try to shut him down that way. I have been in contact with most of the other reviewers who've been violated here, so if Google finds themselves bombarded with copyright complaints against the same guy, the banhammer might come down a little more efficiently. In the meantime, we can just expose this guy for what he is, which means people tweeting this post far and wide. Cesar wants to use the internet to make money, and that will be hard for him if words like "infringement" and "piracy" and "plagiarism" keep popping up in searches for his name. As of a little after midnight on the morning of Tuesday, 4/17/12, Cesar has apparently found out his villainy is all over Twitter, and has taken down his plagiarized version of my Fuzzy Nation review, as well as all the ones linked in this post. This was after ballsily plagiarizing my review of Patricia Briggs' Blood Bound earlier in the evening (which is still up). However, I have just discovered his "reviews" of Suzanne Collins' Catching Fire and Jim Butcher's Summer Knight were also mine (both now taken down). So he's still got a some infringement up there as of this writing. But at this point, I'm going to consider that Cesar's thrown his hand in. He's deleting reviews like mad, and I suspect the blog itself will be down before long. Doubtless he'll find something else equally sleazy to move on to, because to do what he does takes a fundamentally dishonest and narcissistic personality type. But at least he's not trying to play in our sandbox now. Poser.